Since 2013 I’ve written over 300 articles that have been published in Forbes, Inc., Entrepreneur, Time, Mashable, TechCrunch, VentureBeat, Fast Company, Business Insider, Fortune, and more. Sure, I got some lucky breaks, but even in those cases there’s luck and there’s “luck.” Before I got a shot at writing for any notable publication I had written over 900 posts on this blog over a 10 year period. That factored directly into getting my contributor position at Forbes. I believe they call that preparation, not luck. Here are six lessons I learned along the way that may help you in your journey to becoming a contributor to one or more of these media outlets. Maybe that’s a bit of an understatement. Yes, my writing at Forbes led directly to other opportunities to write, as in “Hey Josh, we saw your writing on Forbes, we’d love for you to do some writing for us.” That has happened once or twice, but in the other 20 cases, even when I was trying to get into a small publication, it appeared they could care less what I had written for Forbes or anyone else. This was the case when I pitched Entrepreneur cold (I found the editor on Twitter and tweeted to him and he responded), leveraging my position at Forbes. The attitude was “That’s great, but what do you have for me, right now?” When you’re pitching it’s not about you, it’s about the publication, the editor, the readers, and what you’re going to deliver. I’ve submitted work to TechCrunch multiple times. The one time I got published, it was through a TechCrunch writer I followed and befriended–not because I was trying to get into TechCrunch, but because he writes about startups in Asia and I’m into that and just wanted to meet him. Two years after I met him I was working on an article for a different publication but once I finished it I realized it would be a good fit for TechCrunch. I pitched it to my friend, he introduced me to his editor, and they published it. That’s the only article I got published there. They no longer accept submissions from outside contributors so I slid in at the last moment and got lucky. 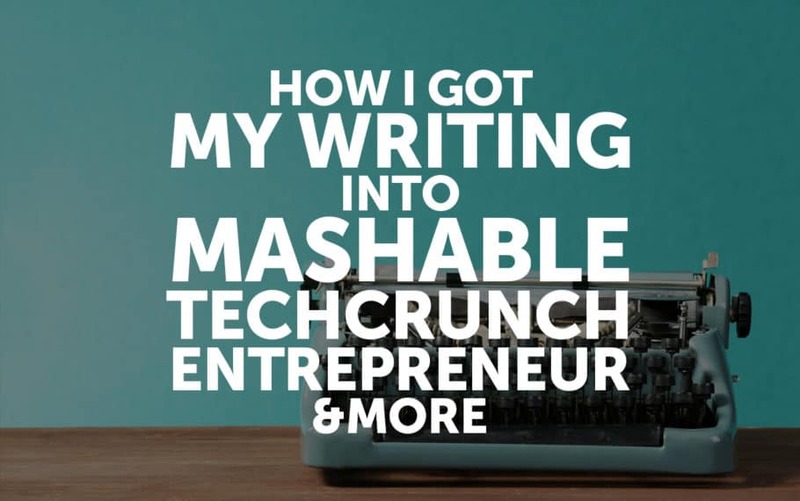 I got into Mashable because I hired an assistant writer who had been published there previously. She made an intro to her editor and I got a few pieces published. Then that editor left Mashable, and I had to pitch the new editor. Thankfully I got in again. I guess you could say I got in twice. Although it can pay to know the right people, that’s not enough. I wouldn’t have gotten into TechCrunch if my article hadn’t been something they were interested in. In fact, I know so, because they rejected it the first time. But, I believe because of my connection, they gave me feedback on what would need to be changed for it to get in. I made those changes, which were fairly extensive, and then they accepted it. TechCrunch was very specific about what they wanted, as are other publications, and often there isn’t much overlap. If you want to get into a pub, you better read enough of the content in that pub to know what they want and what they don’t want. Because each pub is different, if they reject your submission it may simply not be the right fit, regardless of how much you rewrite it. But maybe it would be a great fit somewhere else. I got my writing into VentureBeat by getting rejected by TechCrunch. TechCrunch rejected an article I wrote so I pitched it to VentureBeat. Does that mean VentureBeat takes substandard work? No, it means TechCrunch has one focus, VentureBeat has another, and they aren’t the same. If your article doesn’t match one pub, take it as an opportunity to pitch it around and perhaps you’ll come out ahead. My writing has been published in Time, Business Insider, and Fortune even though I’ve never pitched them or sent anything to them. How? Because they syndicated it from other publications like Entrepreneur and Forbes. I was as surprised as anybody when my writing showed up in Time. I didn’t know about the syndication agreement at the time. The shotgun approach is to write now, write often, and write everywhere. That “everywhere” approach may not be right for you, but it worked for me. I’ve seen others achieve great success by focusing on one blog or publication. But everyone I know who is great at writing writes a lot. What other pubs would I like to write for? I’d like to get my writing into the New York Times and the Wall Street Journal. I’ve made some moderate attempts but those two are hard nuts to crack. How about you, if you’re a contributor how did you get into the publications you write for?